If Little Red Riding Hood had met T. rex (Tyrannosaurus rex) instead of the Big Bad Wolf, it would have told her its giant jaw opened super-wide and had razor-sharp teeth 15 centimeters (5.9 inches) long – all the better to eat her with and crush her bones. T. Rex jaw features were typical of meat-eating theropod dinosaurs. A new study from the University of Bristol in England found that what dinosaurs ate was closely associated with how wide they could open their jaws. Using computer analyses and digital models, Dr. Stephan Lautenschlager, who works at Bristol’s School of Earth Sciences, studied the muscle strain when the jaws of three different theropod dinosaurs opened, and compared the results with their dietary habits. Theropods were carnivorous dinosaurs of a group whose members were typically two-legged and ranged from small and delicately built to extremely large. The word Theropod comes from the Greek for ‘beast footed’. They were the largest meat-eaters ever to walk the Earth. – Tyrannosaurus rex: also called T. rex, was a large, carnivorous theropod with a huge skull and 15cm-long teeth. – Allosaurus fragilis: – a theropod that was slightly smaller than T. rex, but predatory and meat-eating. – Erlikosaurus andrewsi: closely related to the two theropods above, but a plant-eating animal. T. rex was a much more deadly predator than the Big Bad Wolf. Dr. Lautenschlager created detailed computer models to simulate jaw opening and closing in order to fully understand the relationship between jaw gape and muscle strain – he also measured the length changes in the digital muscles. He compared the muscle strain and maximal jaw gape of modern-day crocodiles and birds – relatives of dinosaurs – to those of Erlikosaurus andrewsi, T. rex and Allosaurus fragilis. He found that Tyrannosaurus and Allosaurus – both carnivores – were capable of an extremely wide gape (up to 90 degrees), compared to the herbivorous Erlikosaurus, whose gape reached just 45 degrees. T. Rex could produce a sustained muscle force for a very wide range of jaw muscles, which would be needed to bite through meat and skin, and also to crush bone. 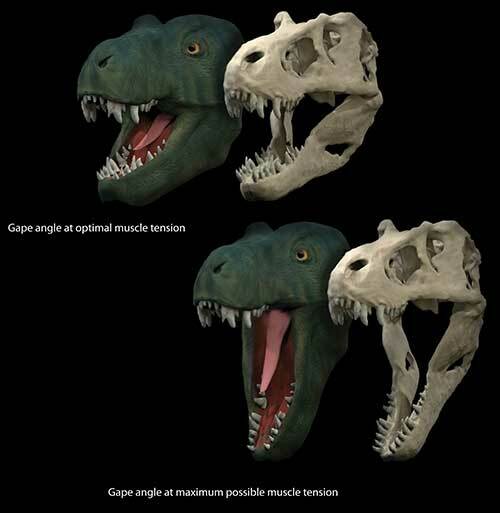 Citation: ‘Estimating cranial musculoskeletal constraints in theropod dinosaurs,’ Stephan Lautenschlager. Royal Society Open Science. Published 4 November 2015.DOI: 10.1098/rsos.150495. This video shows gape cycles and strain factors for modern species of crocodiles and birds in comparison with Allosaurus fragilis, Tyrannosaurus rex and Erlikosaurus andrewsi.